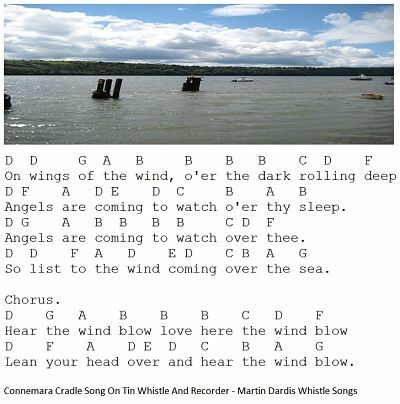 Connemara Cradle Song Notes For Tin Whistle Or Recorder. This one is a lullaby from the West Of Ireland. A Lullaby song was, and perhaps still is used to to send babies to sleep in their mothers arms or by gently rocking them in the cradle. Regarding the level of difficulty, this one is in between beginners and intermedate whistle playing. Every line in the song starts with a low D note, the other D's are high and are played the same way but by blowing harder. You may notice in the video that I sometimes play a D different by lifting my finger on the hole closest to the mouth piece, this is just the way I learned to play the high D. You'll get the same sound regardless of which way you play it. Old habits die hard.